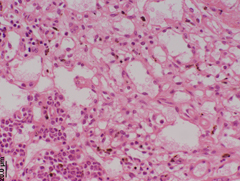 387 (of 387) pathology reports displayed, including 1359 images. 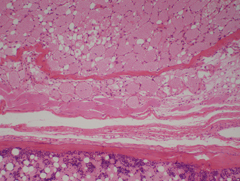 This is a mesenteric lipoma, possibly pedunculated and infarcted, in a 636 day old male C57BL/10J mouse. 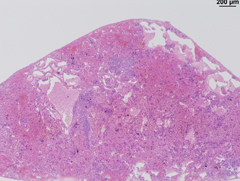 These are relatively rare incidental findings in all animals. 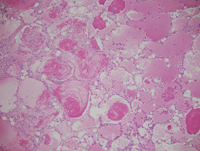 This is a pedunculated lipoma that under went torsion and subsequent necrosis. 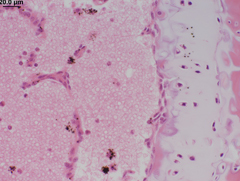 This was found in the fat within the scrotum of a 615 day old male C57BL/6J mouse. 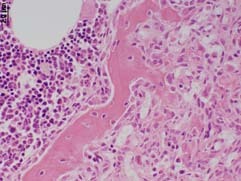 This is a 4x image that is a higher magnification of the 2x image. 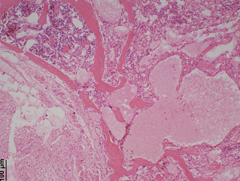 This is a pedunculated lipoma that under went torsion and subsequent necrosis. 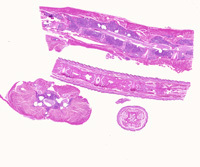 This was found in the fat within the scrotum of a 615 day old male C57BL/6J mouse. This is a 2x image. 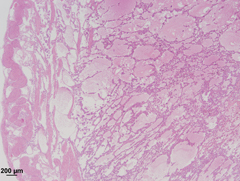 This is a pedunculated lipoma that under went torsion and subsequent necrosis. 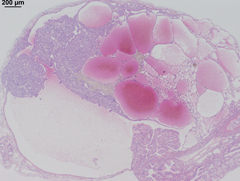 This was found in the fat within the scrotum of a 615 day old male C57BL/6J mouse. 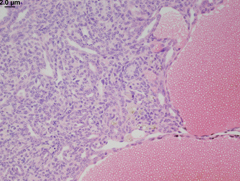 This is a \10x image that is a higher magnification of the center region of the 4x image. 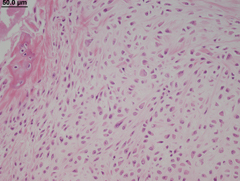 This is a pedunculated lipoma that under went torsion and subsequent necrosis. 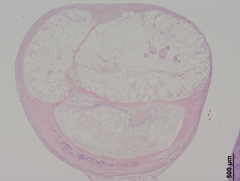 This was found in the fat within the scrotum of a 615 day old male C57BL/6J mouse. This is a 20x image that is a higher magnification of the 10x image. 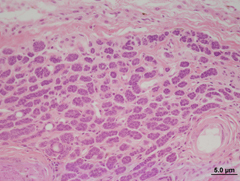 This is a pedunculated lipoma that under went torsion and subsequent necrosis. 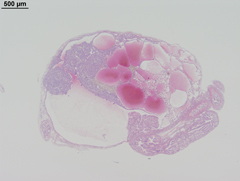 This was found in the fat within the scrotum of a 615 day old male C57BL/6J mouse. 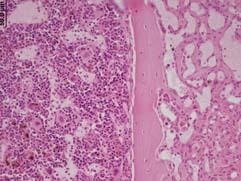 This is a 40x image that is a higher magnification of the 20x image. 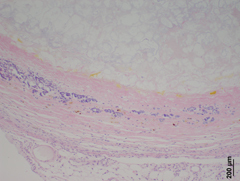 This is a pedunculated lipoma that under went torsion and infarction in the mesenteric fat of a 400 day old male A/J mouse. 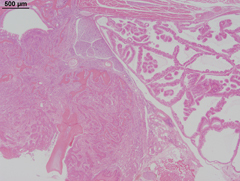 This 10x image (10cx) is a higher magnification of the lower left area of image 2.5bx. 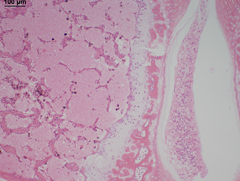 This is a pedunculated lipoma that under went torsion and infarction in the mesenteric fat of a 400 day old male A/J mouse. 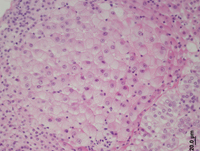 This 40x image is a higher magnification of the left center area of image 10cx. 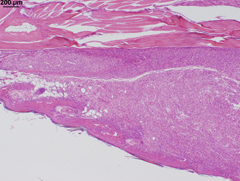 This is a pedunculated lipoma that under went torsion and infarction in the mesenteric fat of a 400 day old male A/J mouse. 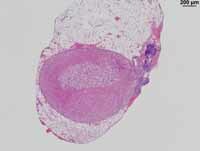 This 10x image (10ax) is a higher magnification of the right center area of image 2.5ax. 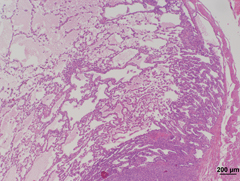 This is a pedunculated lipoma that under went torsion and infarction in the mesenteric fat of a 400 day old male A/J mouse. This is image 2.5ax, a 2.5x image. 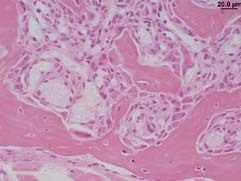 This is a pedunculated lipoma that under went torsion and infarction in the mesenteric fat of a 400 day old male A/J mouse. 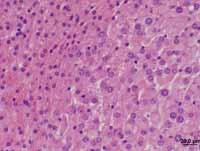 This 10x image (10bx) is a higher magnification of the left center area of image 2.5bx. 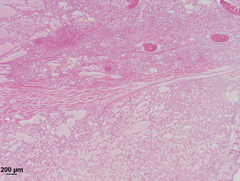 This is a pedunculated lipoma that under went torsion and infarction in the mesenteric fat of a 400 day old male A/J mouse. This is image 2.5b, a 2.5x image. This is a 10x image stained with aldehyde fuschin. It is a higher magnification of the upper-right area of the 2.5x image and is rotated 45 degrees clock-wise. 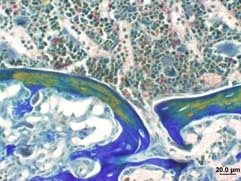 This is a 25x image stained with aldehyde fuschin. It is a higher magnification of the right-center area of the 10x image. 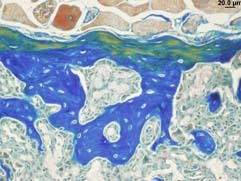 This is a 2.5x image stained with aldehyde fuschin. 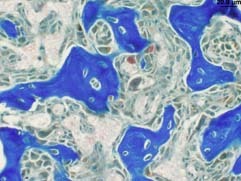 This is a 25x image stained with aldehyde fuschin. It is a higher magnification of the left-center area of the 10x image. 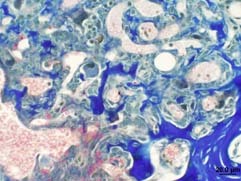 This is a 4x image stained with aldehyde fuschin. 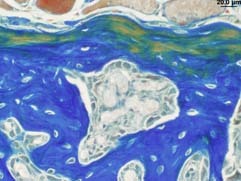 This is a 40x image stained with aldehyde fuschin. It is a higher magnification of the left-center area of the 25x image. This is a 10x image stained with aldehyde fuschin. It is a higher magnification of the lower-right area of the 4x image. 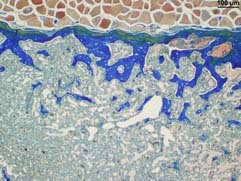 This is 40x, a 40x image stained with aldehyde fuschin. It is a higher magnification of the upper right-center area of the 25x image. 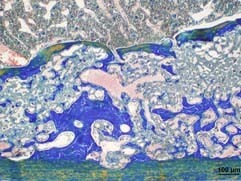 This is 4x, a 4x image stained with aldehyde fuschin. 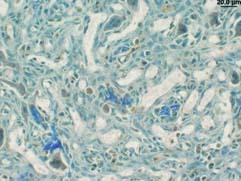 This is 40bx, a 40x image stained with aldehyde fuschin. 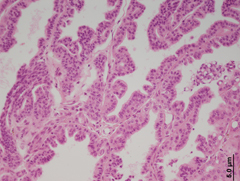 It is a higher magnification of the upper-right area of the 25bx image. 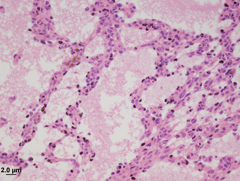 This is 25bx, a 25x image stained with aldehyde fuschin. It is a higher magnification of the lowe right-center area of the 4x image. 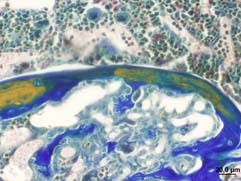 This is 25x, a 25x image stained with aldehyde fuschin. It is a higher magnification of the center-right area of the 10x image. 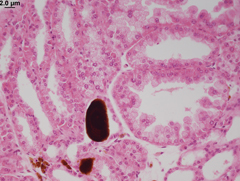 This is 4bx, a 4x image stained with aldehyde fuschin. This is a 10x image that is a higher magnification of the bottom-center region of the 2.5x image. This is a 2.5x image. This is a 40x image, 40xa, that is a higher magnification of the left-center area of the 4x image. This is a 25x image that is a higher magnification of the right-center area of the 10x image. This is a 10x image that is a higher magnification of the lower-center area of the 4x image. This is a 40x image, 40xb, that is a higher magnification of the lower-left area of the 10x image. 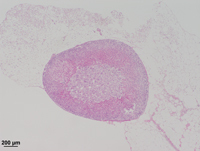 This is a 40x image, 40xc, that is a higher magnification of the center area of the 25x image. This is a 4x image. This is a 4x image, 4x, that is a higher magnification of the right, middle area of the 2.5x image. 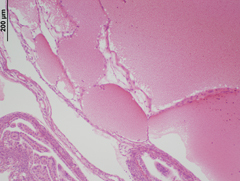 This is a 40x image, 40x, that is a higher magnification of the right, middle region of the 4x image. 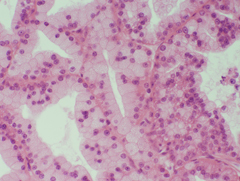 This is an adrenal gland from a 625 day old female BALB/cByJ mouse. 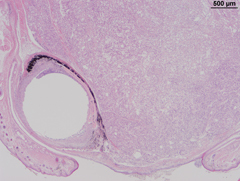 The cortex (outer layer) should normally be uniform in thickness and tinctorial qualities. 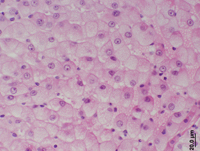 Thre are dark blue spindle cells proliferating (subcapsular cells) a common finding in mature and old mice. 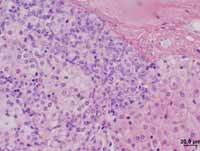 In addition there is a nodule of proliferating pale cells which are presumably an adrenal cortical adenoma. 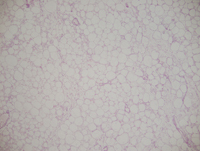 Immunohistochemistry will need to be done to determine which cell type is forming this lesion. 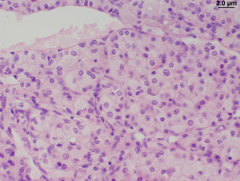 This is an adrenal gland from a 625 day old female BALB/cByJ mouse. 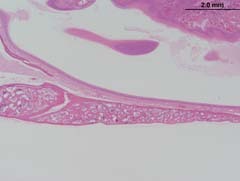 The cortex (outer layer) should normally be uniform in thickness and tinctorial qualities. 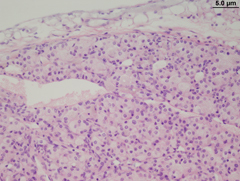 Thre are dark blue spindle cells proliferating (subcapsular cells) a common finding in mature and old mice. 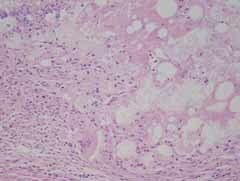 In addition there is a nodule of proliferating pale cells which are presumably an adrenal cortical adenoma. 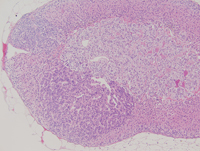 Immunohistochemistry will need to be done to determine which cell type is forming this lesion. 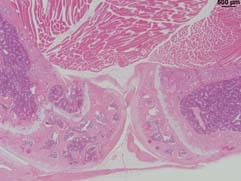 Image is a higher magnification of the left-center portion of the 4x image. 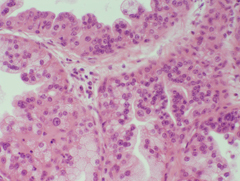 This is an adrenal gland from a 625 day old female BALB/cByJ mouse. 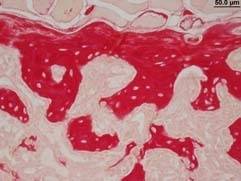 The cortex (outer layer) should normally be uniform in thickness and tinctorial qualities. 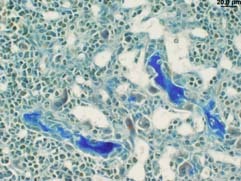 Thre are dark blue spindle cells proliferating (subcapsular cells) a common finding in mature and old mice. 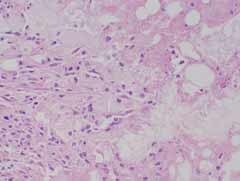 In addition there is a nodule of proliferating pale cells which are presumably an adrenal cortical adenoma. 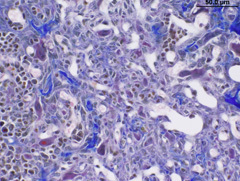 Immunohistochemistry will need to be done to determine which cell type is forming this lesion. 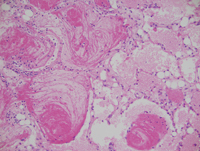 Image is a higher magnification of the bottom left-center portion of the 4x image. 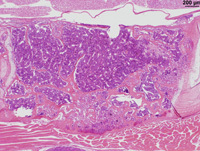 This is the adrenal gland from a 629 day old male BTBR mouse. 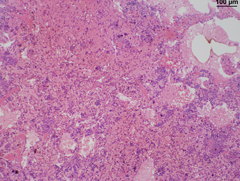 Note the compression of adjacent parenchyma by the benign adrenocortical adenoma. 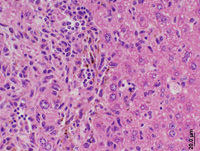 This is the adrenal gland from a 625 day old male PWD/PHJ mouse. 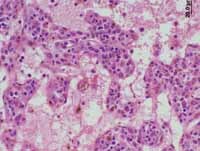 Note the focal mass of cells that are dark blue and in an abnormal pattern in the adrenal cortex. 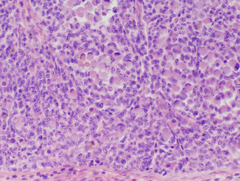 This may be an early adrenocortical adenoma. 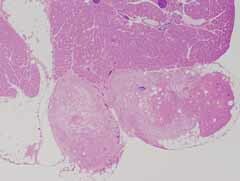 This is an adrenocortical adenoma in a 624 day old CBA/J male mouse. 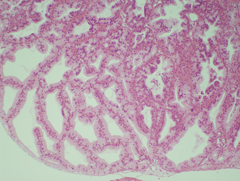 This is the adrenal gland from a 619 day old male C3H/HeJ mouse. 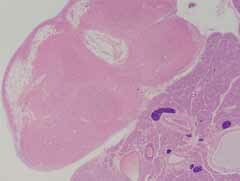 This is an adrenocortical adenoma. 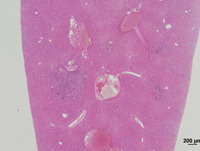 These are common in old C3H/HeJ mice. 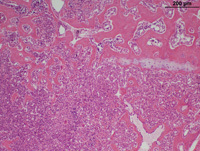 This is an adrenal cortical adenoma in a 621 day old NZW/LacJ male mouse. This is a 4x image. 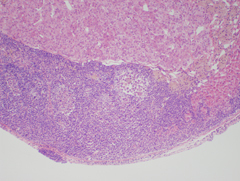 This is an adrenal cortical adenoma in a 621 day old NZW/LacJ male mouse. This is a 10x image and is a higher magnification of the lower left center of the 4x image. 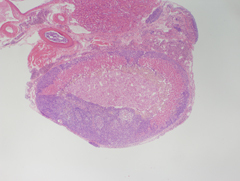 This is an adrenal gland from a 401 day old FVB/NJ male mouse. 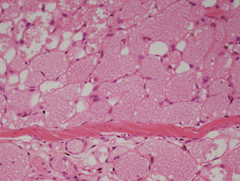 Note the expansile mass compressing the cortex. 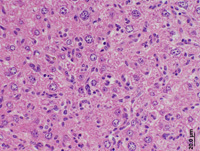 This is an adrenal cortical adenoma which is common in many aging inbred strains. 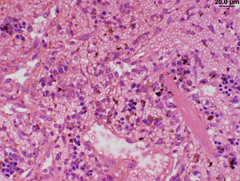 This is a 40x image that is a higher magnification of the bottom center portion of the 25x image. 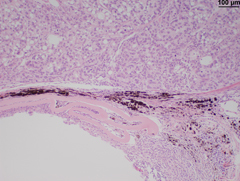 This is an adrenal gland from a 401 day old FVB/NJ male mouse. Note the expansile mass compressing the cortex. 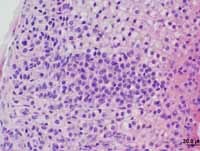 This is an adrenal cortical adenoma which is common in many aging inbred strains. This is a 25x image that is a higher magnification of the bottom center portion of the 10x image. 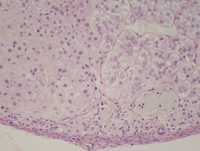 This is an adrenal gland from a 401 day old FVB/NJ male mouse. Note the expansile mass compressing the cortex. 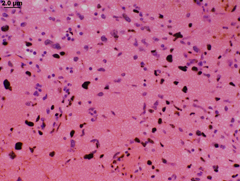 This is an adrenal cortical adenoma which is common in many aging inbred strains. This is a 4x image. 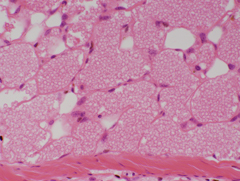 This is an adrenal gland from a 401 day old FVB/NJ male mouse. Note the expansile mass compressing the cortex. 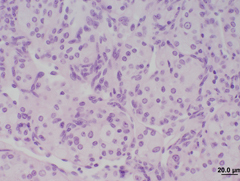 This is an adrenal cortical adenoma which is common in many aging inbred strains. 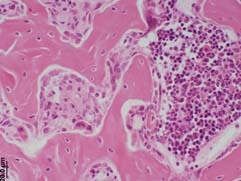 This is a 10x image that is a higher magnification of the center portion of the 4x image. 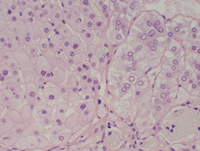 This is an adrenal gland from a 401 day old male 129s1/SvlmJ mouse. 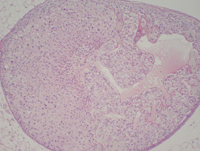 Node the nodule swelling of cells with clear cytoplasm at one pole. 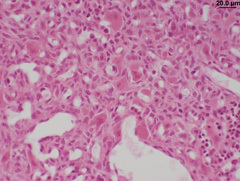 This is an adrenal cortical adenoma. 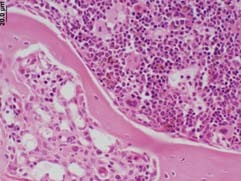 This is a 25x image that is a higher magnification of the left center portion of the 4x image. 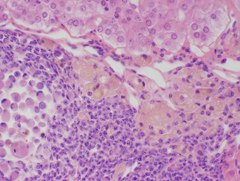 This is an adrenal gland from a 401 day old male 129s1/SvlmJ mouse. 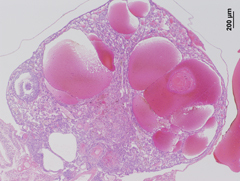 Node the nodule swelling of cells with clear cytoplasm at one pole. 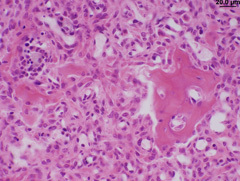 This is an adrenal cortical adenoma. 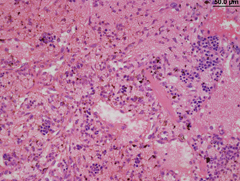 This is a 40x image that is a higher magnification of the right portion of the 25x image. 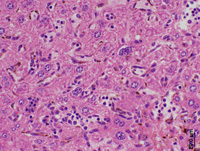 This is an adrenal gland from a 401 day old male 129s1/SvlmJ mouse. 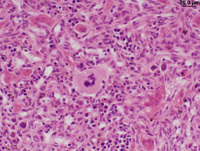 Node the nodule swelling of cells with clear cytoplasm at one pole. 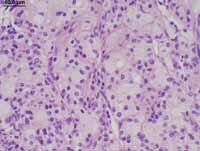 This is an adrenal cortical adenoma. This is a 4x image. 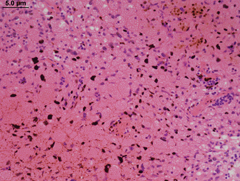 This is a 25x image that is a higher magnification of the top-center portion of the 4x image. 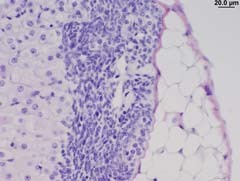 This is a 40x image that is a higher magnification of the lower-left portion of the 4x image. 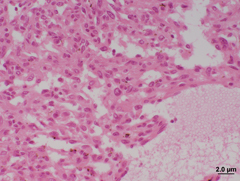 This is a 25x image that is a higher magnification of the center area of the 10x image. 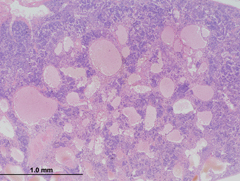 This is a 40x image that is a higher magnification of the center area of the 25x image. 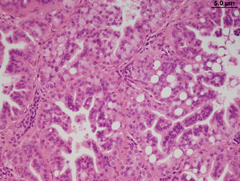 This is a 10x image that is a higher magnification of the upper-right area of the 4x image. 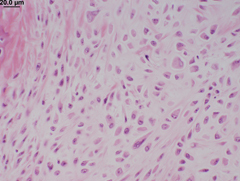 This is a 10x image that is a higher magnification of the center region of the 4x image. 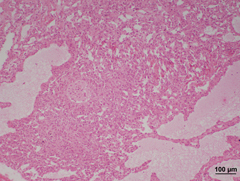 This is a 40x image that is a higher magnification of the center of the 25x image. 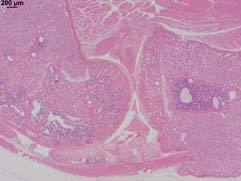 This is a 25x image that is a higher magnification of the upper right region of the 10x image. 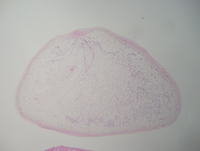 This is a mass found in the skeletal muscle from a 563 day old BALB/cByJ male mouse. 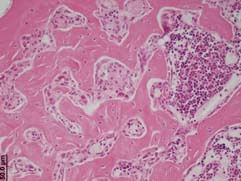 Note the large blood filled vascular spaces separated by a network of neoplastic vessels of various sizes containing red blood cells. 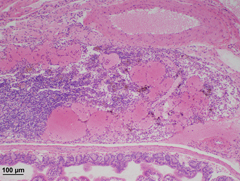 4x magnification. 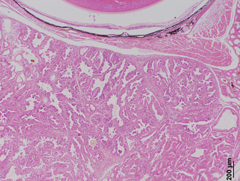 This is a mass found in the skeletal muscle from a 563 day old BALB/cByJ male mouse. 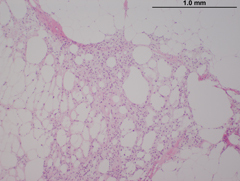 Note the large blood filled vascular spaces separated by a network of neoplastic vessels of various sizes containing red blood cells. 25x magnification. 639 day old male FVB/NJ mouse. 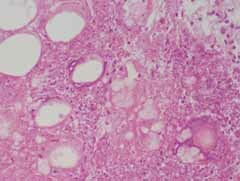 The liver has multiple areas of various sizes in which the hepatic parenchyma is being replaced by large spindle-shaped cells, many of which have a golden brown pigment (hemosiderin) within their cytoplasm. 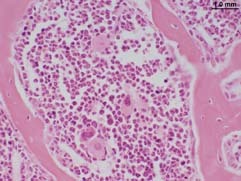 In some areas these are clearly differentiating into vascular structures containing erythrocytes consistent with this being an hemangiosarcoma. 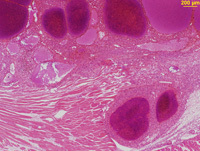 Higher magnification of a portion of the 2.5x image. 639 day old male FVB/NJ mouse. 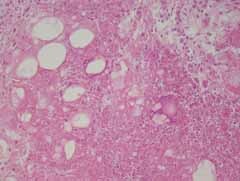 The liver has multiple areas of various sizes in which the hepatic parenchyma is being replaced by large spindle-shaped cells, many of which have a golden brown pigment (hemosiderin) within their cytoplasm. 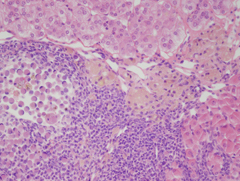 In some areas these are clearly differentiating into vascular structures containing erythrocytes consistent with this being an hemangiosarcoma. Shows multiple foci. 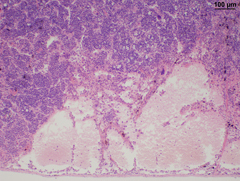 This is a massively enlarged pancreatic lymph node from a 636 day old C57BL/10J female mouse. 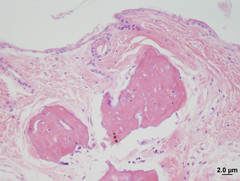 Note the large numbers of endothelial lined spaces in the node and adjacent encapsulated structures. 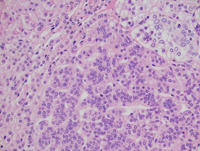 Due to its large size and expansile nature this is most likely an hemangiosarcoma. 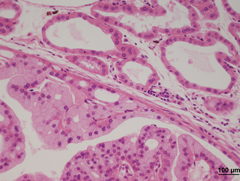 This is an ovary from a 633 day old female RIIIS/J mouse. 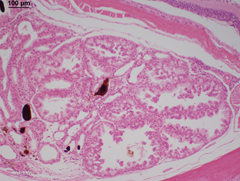 The ovarian stroma has been completely effaced by cysts formed from the invading surface epithelium creating an ovarian adenoma. 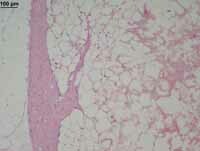 Concurrently there is proliferation of blood filled vessels. 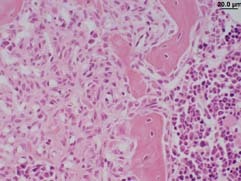 This latter change may be an hemangioma or telangeictasia. 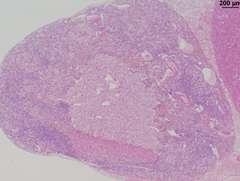 This is a cavernous hemangioma in a fat pad of a 616 day old female C57BLKS/J mouse. 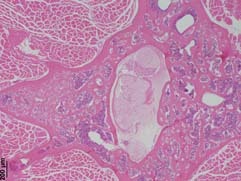 Note the numerous vascular spaces of various sizes some of which are thrombosed. 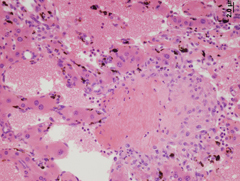 This is a 20x image that is a higher magnification of the central region of the 10x image. 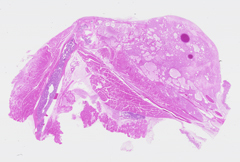 This is a cavernous hemangioma in a fat pad of a 616 day old female C57BLKS/J mouse. 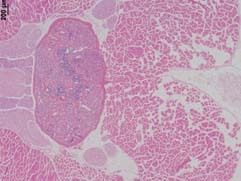 Note the numerous vascular spaces of various sizes some of which are thrombosed. This is a 4x image. 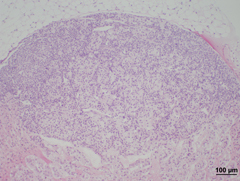 This is a cavernous hemangioma in a fat pad of a 616 day old female C57BLKS/J mouse. 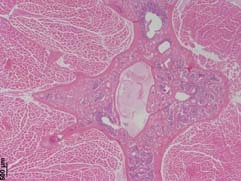 Note the numerous vascular spaces of various sizes some of which are thrombosed. 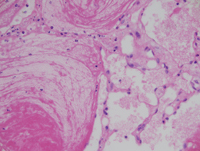 This is a 40x image that is a higher magnification of the central region of the 20x image. 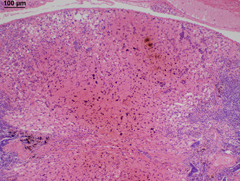 This is a cavernous hemangioma in a fat pad of a 616 day old female C57BLKS/J mouse. 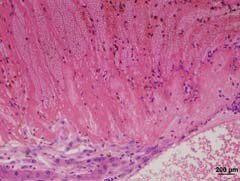 Note the numerous vascular spaces of various sizes some of which are thrombosed. 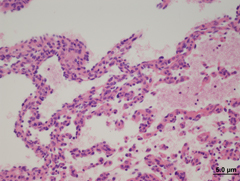 This is a 10x image that is a higher magnification of the central region of the 4x image. 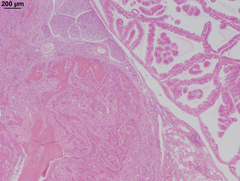 This is the ovary of a 624 day old female BUBB/bnJ mouse. 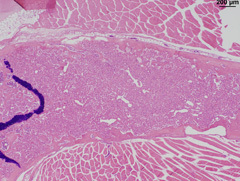 Note the large numbers of vascular channels of various sizes. 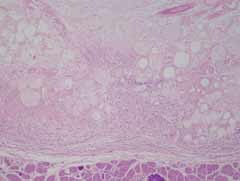 This is an hemangiosarcoma. 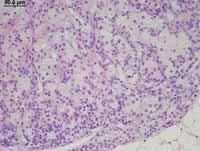 The diagnosis is supported by finding simlar changes in the spleen and other organs. 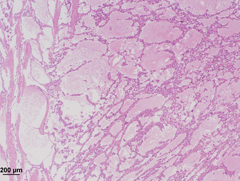 This 25x image is a higher magnification of the right center area of the 10x image. 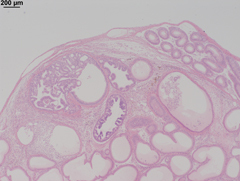 This is the ovary of a 624 day old female BUBB/bnJ mouse. 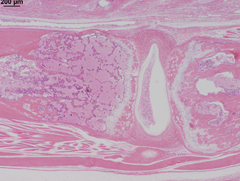 Note the large numbers of vascular channels of various sizes. 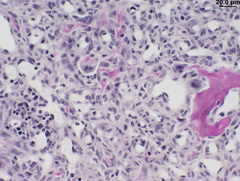 This is an hemangiosarcoma. 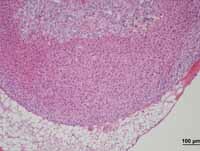 The diagnosis is supported by finding simlar changes in the spleen and other organs. 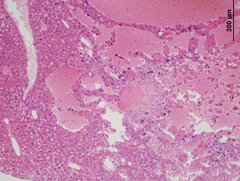 This 4x image is a higher magnification of the center area of the 2.5x image. 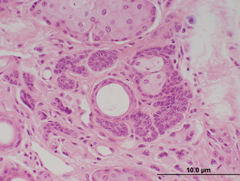 This is the ovary of a 624 day old female BUBB/bnJ mouse. 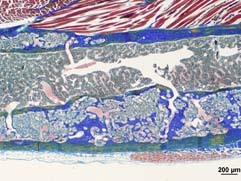 Note the large numbers of vascular channels of various sizes. 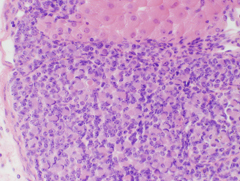 This is an hemangiosarcoma. 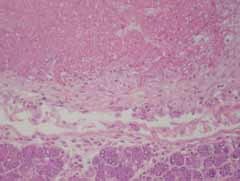 The diagnosis is supported by finding simlar changes in the spleen and other organs. 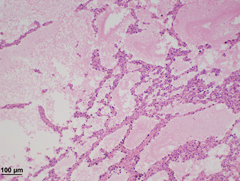 This 40x image is a higher magnification of the center area of the 25x image. 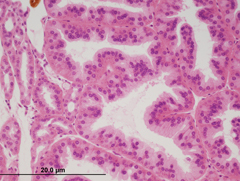 This is the ovary of a 624 day old female BUBB/bnJ mouse. 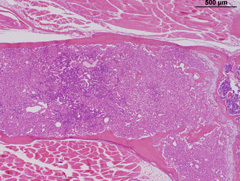 Note the large numbers of vascular channels of various sizes. 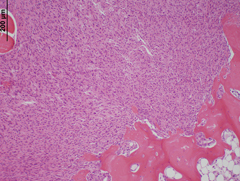 This is an hemangiosarcoma. 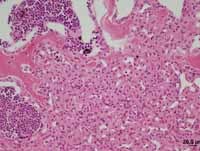 The diagnosis is supported by finding simlar changes in the spleen and other organs. This is a 2.5x image. 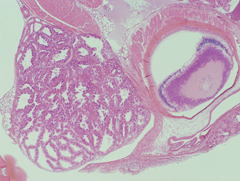 This is the ovary of a 624 day old female BUBB/bnJ mouse. 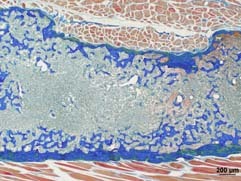 Note the large numbers of vascular channels of various sizes. 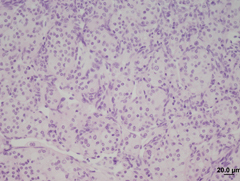 This is an hemangiosarcoma. 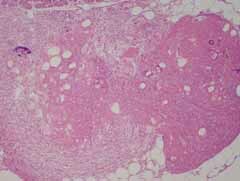 The diagnosis is supported by finding simlar changes in the spleen and other organs. This 10x image is a higher magnification of the upper center area of the 4x image. 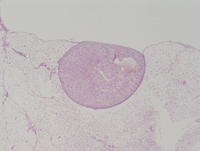 This is the spleen of a 624 day old female BUBB/bnJ mouse. 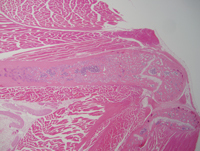 Note the large numbers of vascular channels of various sizes. 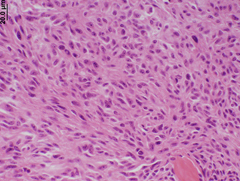 This is an hemangiosarcoma. 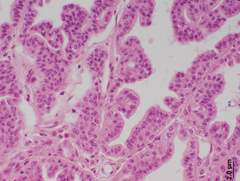 The diagnosis is supported by finding simlar changes in the ovary and other organs. This is a 2.5x image. 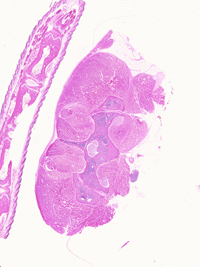 This is the spleen of a 624 day old female BUBB/bnJ mouse. 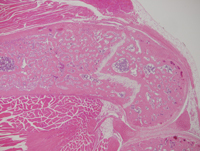 Note the large numbers of vascular channels of various sizes. 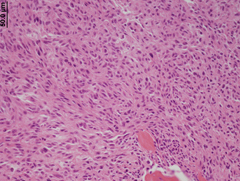 This is an hemangiosarcoma. 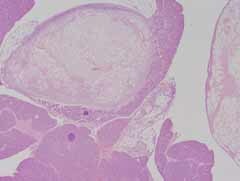 The diagnosis is supported by finding simlar changes in the ovary and other organs. This 4x image is a higher magnification of the upper center area of the 2.5x image. 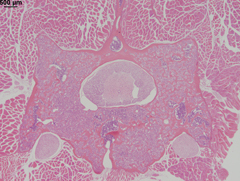 This is the spleen of a 624 day old female BUBB/bnJ mouse. 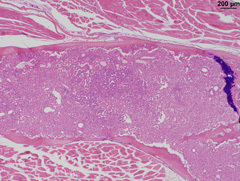 Note the large numbers of vascular channels of various sizes. 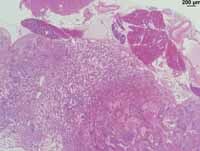 This is an hemangiosarcoma. 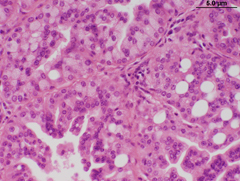 The diagnosis is supported by finding simlar changes in the ovary and other organs. 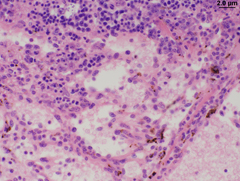 This 25x image is a higher magnification of the upper right area of the 10x image. 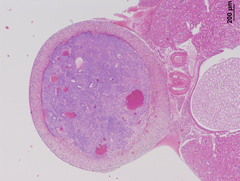 This is the spleen of a 624 day old female BUBB/bnJ mouse. 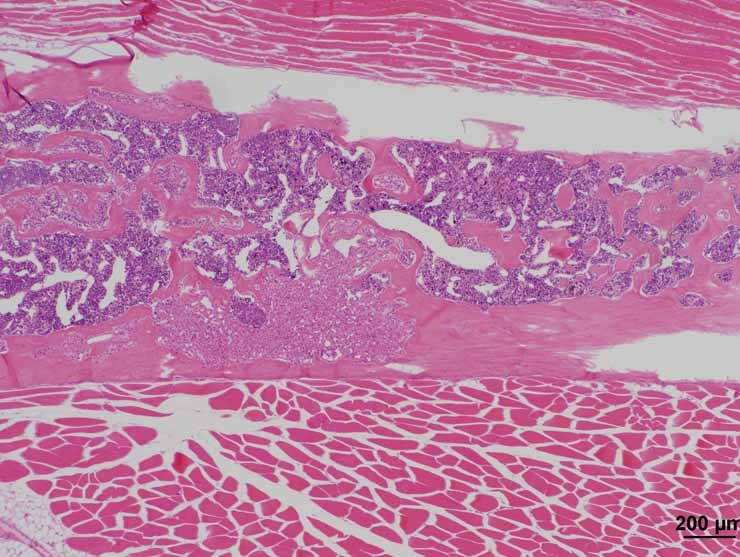 Note the large numbers of vascular channels of various sizes. 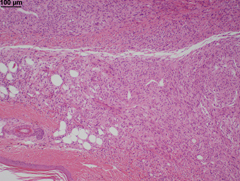 This is an hemangiosarcoma. 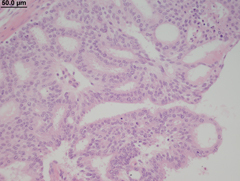 The diagnosis is supported by finding simlar changes in the ovary and other organs. 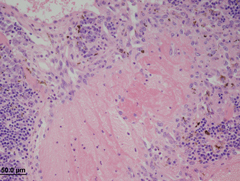 This 25x image is a higher magnification of the right center area of the 40x image. 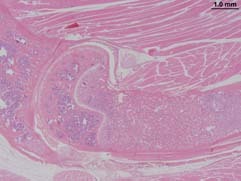 This is the spleen of a 624 day old female BUBB/bnJ mouse. 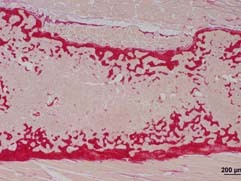 Note the large numbers of vascular channels of various sizes. 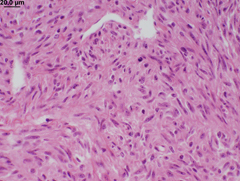 This is an hemangiosarcoma. 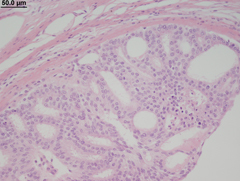 The diagnosis is supported by finding simlar changes in the ovary and other organs. 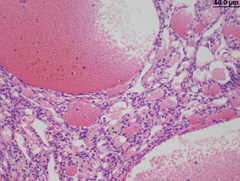 This 10x image is a higher magnification of the right center area of the 4x image. 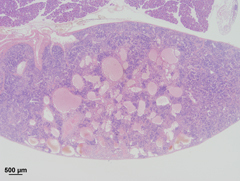 This is a 40x image that is a higher magnification of the center portion of the 25x image. 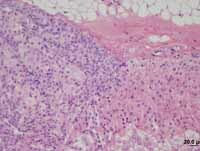 This is a 10x image that is a higher magnification of the lower-right portion of the 4x image. 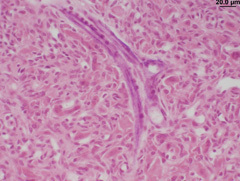 This is a 25x image that is a higher magnification of the center portion of the 10x image. This is a 10x image that is a higher magnification of the bottom left-center portion of the 4x image. 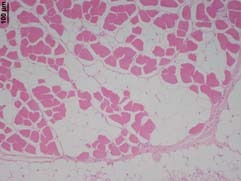 This is a 40x image that is a higher magnification of the centerr portion of the 25x thrombus image. 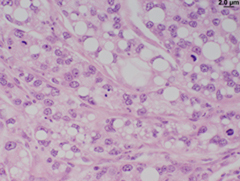 This is a 40x image that is a higher magnification of the center portion of the 10x image. 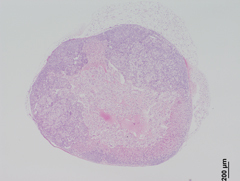 This is a 25x image of a thrombus in a spleen hemangioma. 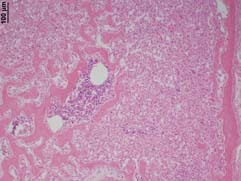 4x image of a tumorous spleen. This is a direct scan. 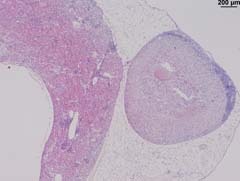 This is a 2.5x image that is a higher magnification of the center portion of the direct scan. 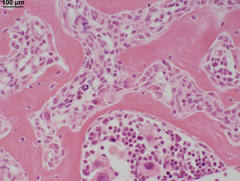 This is a 10x image that is a higher magnification of the center portion of the 2.5x image. This is a 40x image that is a higher magnification of the bottom-center portion of the 10x image. 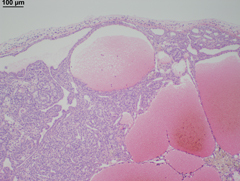 This is a 4x image that is a higher magnification of the center region of the 2.5x image. This is a 10x image that is a higher magnification of the top-center region of the 4x image. This is a 25x image that is a higher magnification of the bottom-center region of the 10x image. 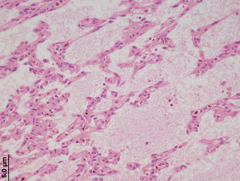 This is a 25x image that is a higher magnification of the center region of the 10x image. This is a 40x image that is a higher magnification of the center region of the 25x image. 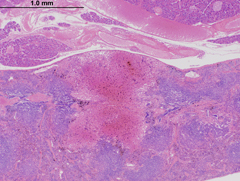 This is image A that is a higher magnification of the center region of image B. 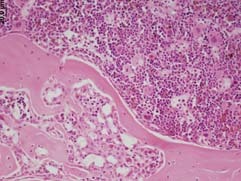 This is image B that is higher magnification of the center region of image C.
This is a 40x image that is a higher magnification of the upper-right region of image 10b. This is a 10x image, image 10a, that is a higher magnification of the bottom-center region of the 2.5x image. This is a 25x image that is a higher magnification of the center region of image 10a. This is a 10x image, image 10b, that is a higher magnification of the bottom-center region of the 2.5x image. This is a 10x image that is a higher magnification of the lower left center region of the 4x image. 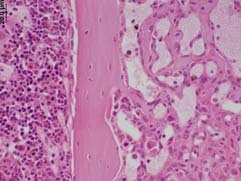 This image is a 2.5x magnification. 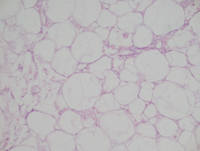 This is a 25x image that is a higher magnification of the right center region of the 10x image. 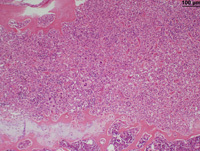 This is a 10x image that is a higher magnification of the lower left region of the 4x image. 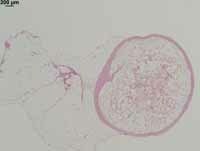 This is a 25x image that is a higher magnification of the center area of the image 10ax. 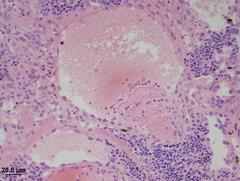 This is a 4x image that is a higher magnification of the center area of the 2.5x image. This is image 10ax, a 10x image. 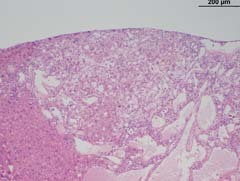 This is image 10bx that is a higher magnification of the lower left area of the 4x image. This is a 10x image that is a higher magnification of the center area of the 4x image. 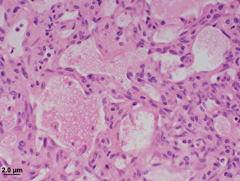 This is a 40x image that is a higher magnification of the bottom left region of the 4x image. 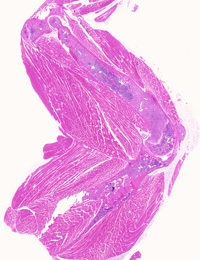 This is a 25x image that is a higher magnification of the lower left region of the 4x image. 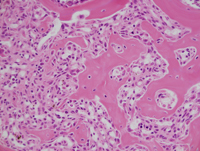 This is a 40x image that is a higher magnification of the center area of the 10x image. This is a 40x image that is a higher magnification of the upper-right area of the 2.5x image. This is a 10x image that is a higher magnification of the center area of the 2.5x image. This is a 25x image that is a higher magnification of the lower-right center area of the 4x image. 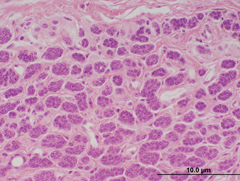 This is a 25x image, 25x, that is a higher magnification of the left center region of image 4x. This is a 4x image, 4x. This is a 10x image, 10xb, that is a higher magnification of the upper, center region of image 4xb. This is a 40x image, 40xa, that is a higher magnification of the center region of image 10xa. This is a 2.5x image, 2.5xb. 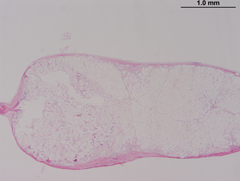 This is a 4x image, 4xb, that is a higher magnification of the center region of image 2.5xb. This is a 40xb image, 40xb, that is a higher magnification of the upper, left center region of image 10xb. This is a 10x image, 10xa, that is a higher magnification of the upper, left region of image 2.5xb. This is a long bone from a 624 day old female KK/J mouse. 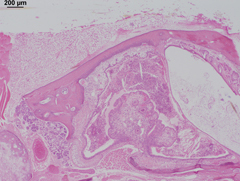 The marrow cavity is filled with mature boney trabeculae and fibrovascular stroma resembling what Cory Brayton reports as fibrous osseous disease. This is a long bone from a 624 day old female KK/J mouse. 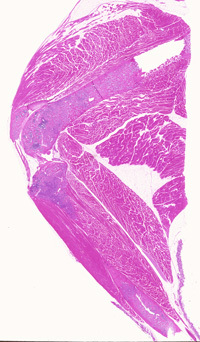 The marrow cavity is filled with mature boney trabeculae and fibrovascular stroma resembling what Cory Brayton reports as fibrous osseous disease. This is a section of a femur. This is a long bone from a 610 day old female KK/J mouse. 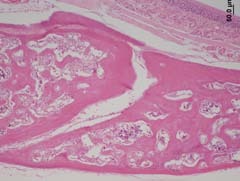 The marrow cavity is filled with mature boney trabeculae and fibrovascular stroma resembling what Cory Brayton reports as fibrous osseous disease. 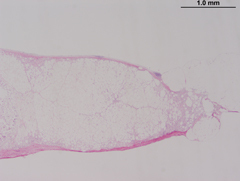 This is a long bone from a 622 day old NZW/LacJ female mouse. 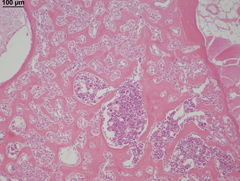 Note the focal abnormality in the bone marrow cavity. 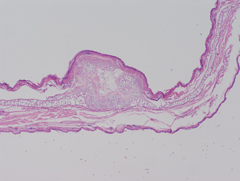 This has been called a "fibrous osseous lesion" by Dr. C Brayton. 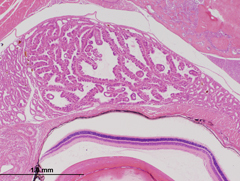 This image was submitted by John Sundberg, the Jackson Laboratory. This is a 40x image, 40xb, that is a higher magnification of the right-middle area of the 10x image. 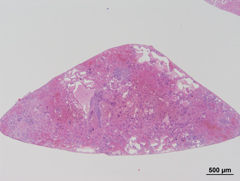 This image was submitted by John Sundberg, the Jackson Laboratory. 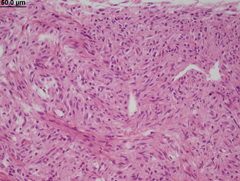 This is a 40x image, 40xc, that is a higher magnification of the upper-left area of the 10x image. 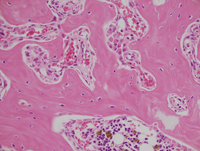 This image was submitted by John Sundberg, the Jackson Laboratory. 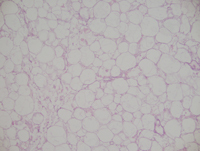 This is a 25x image that is a higher magnification of the center area of the 10x image. 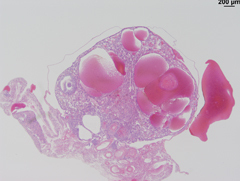 This image was submitted by John Sundberg, the Jackson Laboratory. 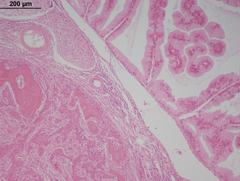 This is a 40x image, 40xd, that is a higher magnification of the center area of the 25x image. 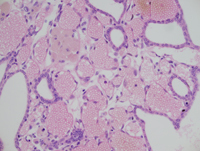 This image was submitted by John Sundberg, the Jackson Laboratory. This is a 40x image, 40xa, that is a higher magnification of the right-middle area of the 4x image. This image was submitted by John Sundberg, the Jackson Laboratory. This is a 10x image that is a higher magnification of the lower-center area of the 4x image. 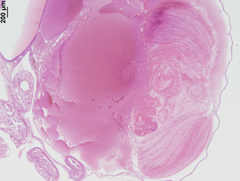 This image was submitted by John Sundberg, the Jackson Laboratory. This is a 4x image. 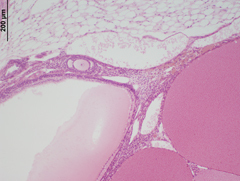 This image was submitted by John Sundberg, the Jackson Laboratory. This is a 40x image, 40xb, that is a higher magnification of the lower, left-center area of the 2.5x image. 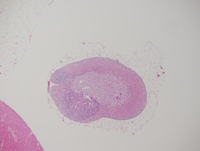 This image was submitted by John Sundberg, the Jackson Laboratory. This is a 10x image that is a higher magnification of the center area of the 4x image. 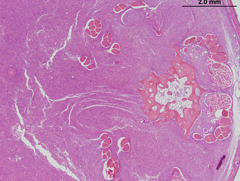 This image was submitted by John Sundberg, the Jackson Laboratory. This is a 25x image that is a higher magnification of the upper-center area of the 10x image. 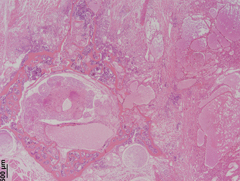 This is a 25x image that is a higher magnification of the center area of the 4x image. 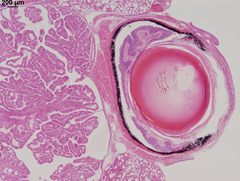 This image was submitted by John Sundberg, the Jackson Laboratory. 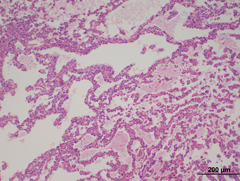 This image was submitted by John Sundberg, the Jackson Laboratory. This is a 40x image, 40xa, that is a higher magnification of the lower-right area of the 2.5x image. 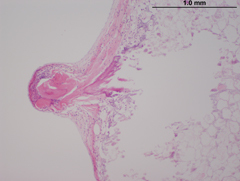 This image was submitted by John Sundberg, the Jackson Laboratory. This is a 40x image, 40xc, that is a higher magnification of the lower-center area of the 2.5x image. 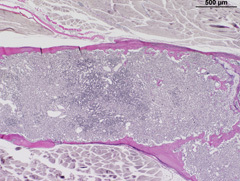 This is a longitudinal section of a femur in which there is marked thickening of the trabeculae and cortical bone. 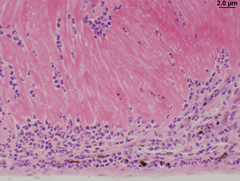 Bone marrow is partially effaced by a fibrovascular stroma. 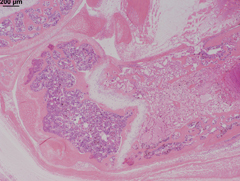 This lesion has been called a fibrousosseous lesion found in very old laboratory mice. This is a 20x image that is a higher magnification of the lower center region of the 10x image. 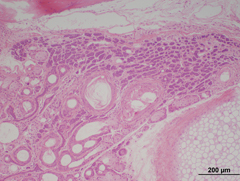 This is a longitudinal section of a femur in which there is marked thickening of the trabeculae and cortical bone. 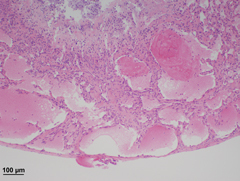 Bone marrow is partially effaced by a fibrovascular stroma. 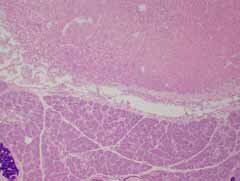 This lesion has been called a fibrousosseous lesion found in very old laboratory mice. 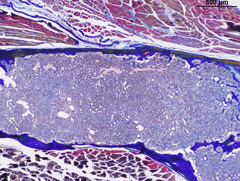 This is a longitudinal section of a femur in which there is marked thickening of the trabeculae and cortical bone. 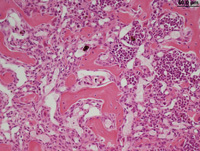 Bone marrow is partially effaced by a fibrovascular stroma. 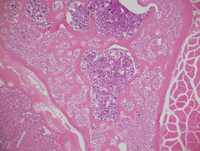 This lesion has been called a fibrousosseous lesion found in very old laboratory mice. This is a 10x image that is a higher magnification of the top center region of the 4x image. 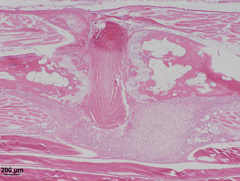 This is a longitudinal section of a femur in which there is marked thickening of the trabeculae and cortical bone. 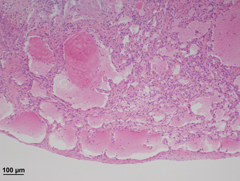 Bone marrow is partially effaced by a fibrovascular stroma. 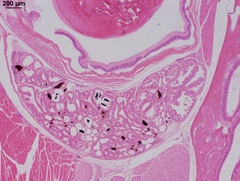 This lesion has been called a fibrousosseous lesion found in very old laboratory mice. 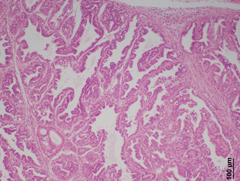 This is a 4x image that is a higher magnification of the lower right region of the 2x image. 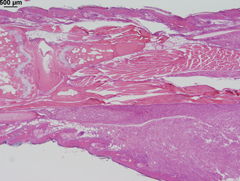 This is a longitudinal section of a femur in which there is marked thickening of the trabeculae and cortical bone. 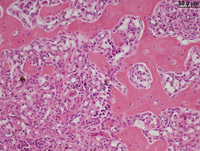 Bone marrow is partially effaced by a fibrovascular stroma. 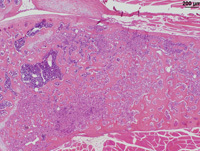 This lesion has been called a fibrousosseous lesion found in very old laboratory mice. This is a 40x image that is a higher magnification of the lower center region of the 20x image. 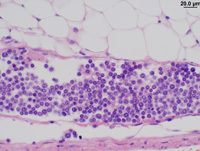 This image was submitted by John Sundberg, the Jackson Laboratory. This is a 2.5x image, 2.5xa. 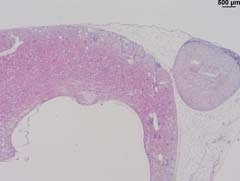 This image was submitted by John Sundberg, the Jackson Laboratory. This is a 2.5x image, 2.5xb. 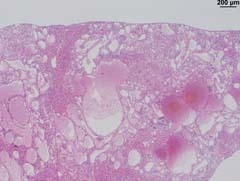 This image was submitted by John Sundberg, the Jackson Laboratory. This is a 40x image, 40xa, that is a higher magnification of the left, middle area of the 2.5x image, 2.5xa. 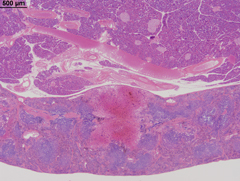 This image was submitted by John Sundberg, the Jackson Laboratory. This is a 40x image, 40xc, that is a higher magnification of the lower, right area of the 2.5x image, 2.5xa. 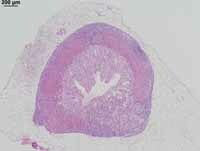 This image was submitted by John Sundberg, the Jackson Laboratory. This is a 40x image, 40xb. 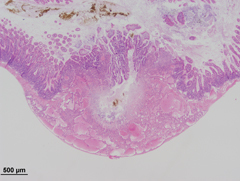 This image was submitted by John Sundberg, the Jackson Laboratory. 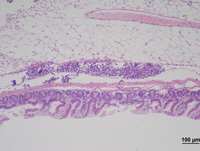 This is a 10x image that is a higher magnification of the upper, right area of the 2.5x image. 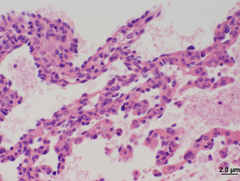 This image was submitted by John Sundberg, the Jackson Laboratory. 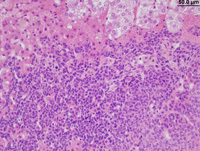 This is a 40x image that is a higher magnification of the center area of the 10x image. 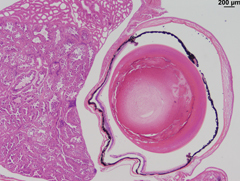 This image was submitted by John Sundberg, the Jackson Laboratory. This is a 2.5x image. 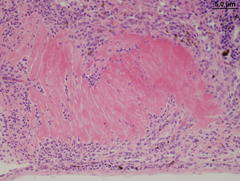 This image was submitted by John Sundberg, the Jackson Laboratory. This is a 10x image that is a higher magnification of the upper-left area of the 2.5x image. 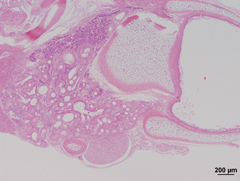 This image was submitted by John Sundberg, the Jackson Laboratory. 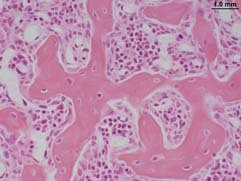 This is a 25x image that is a higher magnification of the left-center, middle area of the 10x image. 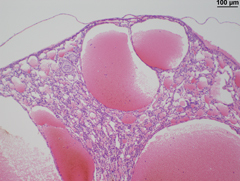 This image was submitted by John Sundberg, the Jackson Laboratory. 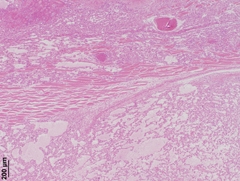 This is a 40x image that is a higher magnification of the center area of the 25x image. 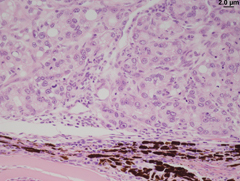 This image was submitted by John Sundberg, the Jackson Laboratory. This is a 10x image that is a higher magnification of the center area of the 2.5x image. 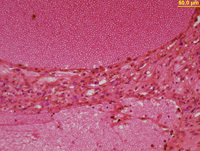 This is a 40x image stained for aldehyde fuchsin that is a higher magnification of the left middle region of the 4x image. 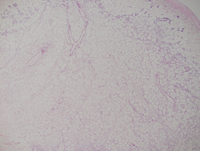 This is a 4x image stained for aldehyde fuchsin. 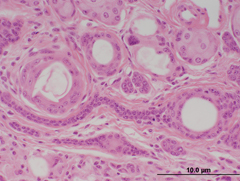 This image was submitted by John Sundberg, the Jackson Laboratory. This is a 40x image, 40xb, that is a higher magnification of the lower, right-center area of the 2.5x image. 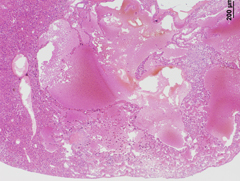 This image was submitted by John Sundberg, the Jackson Laboratory. This is a 40x image, 40xa, that is a higher magnification of the left-middle area of the 2.5x image. 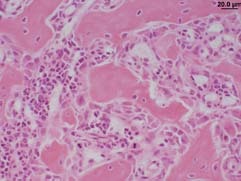 This is a 4x image stained with H&E. 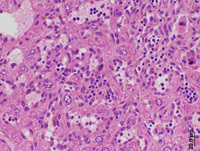 This is a 40x image stained with H&E that is a higher magnification of the right middle region of the 4x image. 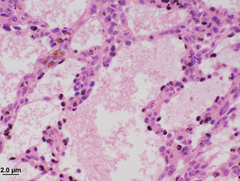 This is a 4x image stained with Verhoeff?Van Gieson stain. 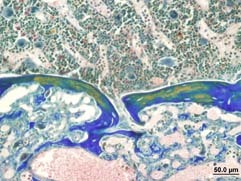 This is a 40x image stained with Mallory's trichrome that is a higher magnification of the right middle region of the 4x image. 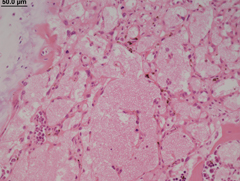 This is a 40x image stained with aldehyde fuchsin that is a higher magnification of the center region of the 4x image. 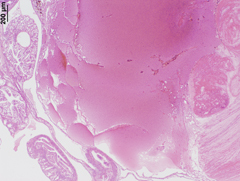 This is a 4x image stained with Mallory's trichrome. 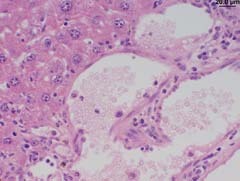 This is a 40x imgae stained with Verhoeff?Van Gieson stain that is a higher magnification of the right middle region of the 4x image. 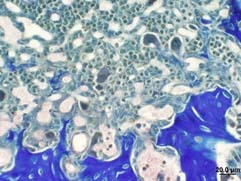 This is a 4x image stained with aldehyde fuschin stain. 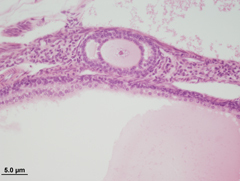 This image was submitted by John Sundberg, the Jackson Laboratory. 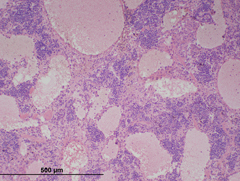 This is a 40x image, 40ax, that is a higher magnification of the right-center area of the 25x image, 25ax. 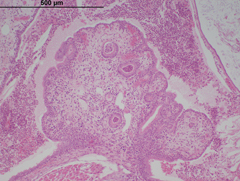 This image was submitted by John Sundberg, the Jackson Laboratory. 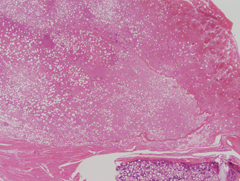 This is a 4x image that is a higher magnification of the lower-right area of the 2.5x image. 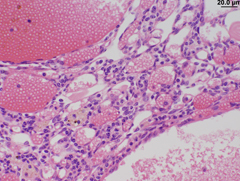 This image was submitted by John Sundberg, the Jackson Laboratory. This is a 40x image, 40x, that is a higher magnification of the center area of the 25x image, 25x. 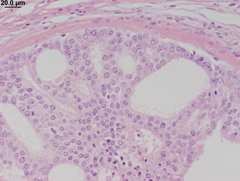 This image was submitted by John Sundberg, the Jackson Laboratory. 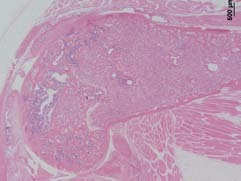 This is a 25x image, 25ax, that is a higher magnification of the upper-middle area of the 4x image. 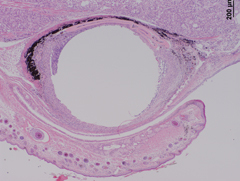 This image was submitted by John Sundberg, the Jackson Laboratory. 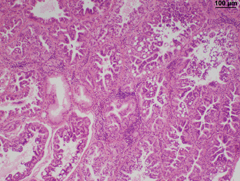 This is a 25x image, 25x, that is a higher magnification of the left-center, middle area of the 4x image. 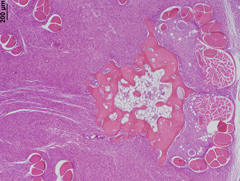 This image was submitted by John Sundberg, the Jackson Laboratory. 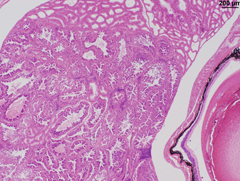 This is a 10x image that is a higher magnification of the left-middle area of the 2.5x image. 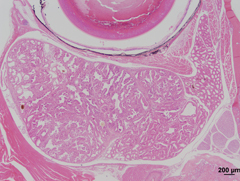 This is a vertebral body from a 633 day old RIIIS/J female mouse. 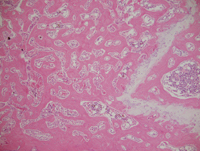 Note the replacement of bone marrow by fibrovascular stroma and very thick boney trabeculae. 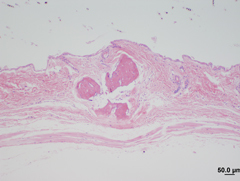 This change was called a fibrooseous lesion by Dr. C. Brayton in a recent review. 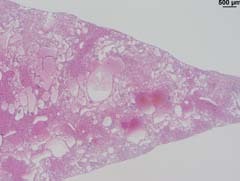 This image is a higher magnification of the upper left-central portion of the 10x image. 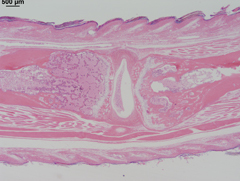 This is a vertebral body from a 633 day old RIIIS/J female mouse. 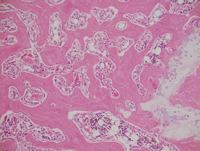 Note the replacement of bone marrow by fibrovascular stroma and very thick boney trabeculae. 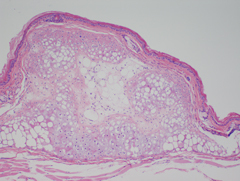 This change was called a fibrooseous lesion by Dr. C. Brayton in a recent review. 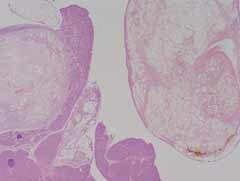 This image is a higher magnification of the lower central portion of the direct scan. 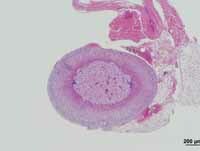 This is a vertebral body from a 633 day old RIIIS/J female mouse. 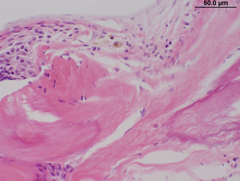 Note the replacement of bone marrow by fibrovascular stroma and very thick boney trabeculae. 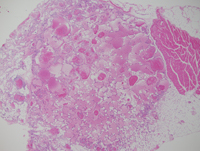 This change was called a fibrooseous lesion by Dr. C. Brayton in a recent review. 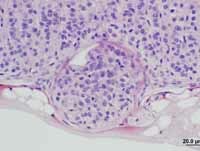 This is a 10x image that is a higher magnification of the right center region of the 2.5x image. This is a 40x image that is a higher magnification of the upper left center region of the 10x image. 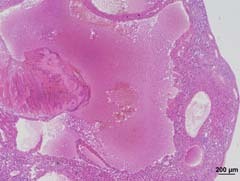 This is a 10x image that is a higher magnification of the center portion of the 4x image. This is a 10x image that is a higher magnification of the bottom-right area of the 4x image. 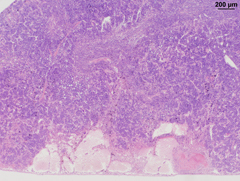 This is a 25xx image that is a higher magnification of the center area of the 10x image. 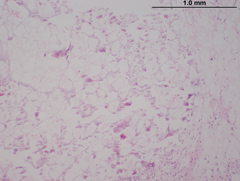 This is a 40x image, 40x, that is a higher magnification of the center region of image 25x. 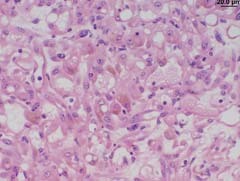 This is a 10x image, 10x, that is a higher magnification of the top, center region of image 4x. 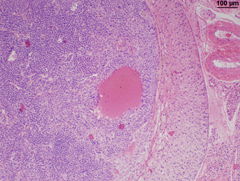 This is a 40x image, 40bx, that is a higher magnification of the right, center region of image 25bx. 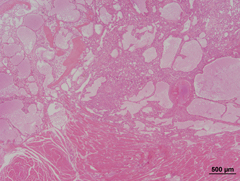 This is a 25x image, 25x, that is a higher magnification of the center region of image 10x. 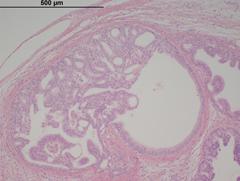 This is a 4x image, 4bx, that is a higher magnification of the center region of image 2.5bx. 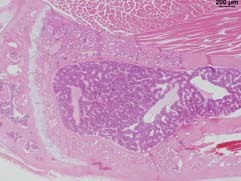 This is a 4x image, 4x, that is a higher magnification of the right, middle region of image 2.5x. This is a 2.5x image, 2.5x. 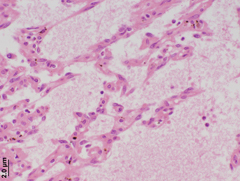 This is a 25x image, 25bx, that is a higher magnification of the center region of image 10bx. 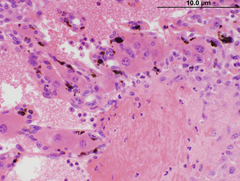 This is a 10x image, 10bx, that is a higher magnification of the center region of image 4bx. This is a 2.5x image, 2.5bx. This is a 10x image that is a higher magnification of the lower-right center area of the 4x image. 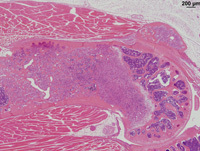 This is a 25x image that is a higher magnification of the upper-right region of the 10x image. 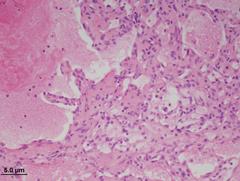 This is a 40x image that is a higher magnification of the center region of the 4x image. This is a 40x image that is a higher magnification of the middle-left of the 10x image. 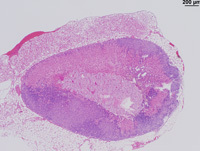 This is a 40x image that is a higher magnification of the upper-right region of the 25x image. 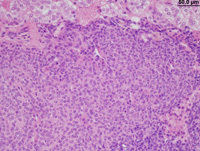 This is a 40x image that is a higher magnification of the upper-right area of the 25bx image. This is a 25x image, 25xa, that is a higher magnification of the upper left-center area of the 10x image. 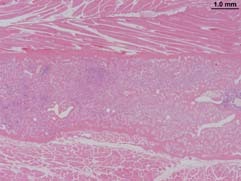 This is a 40x image that is a higher magnification of the upper-left area of the 4x image. 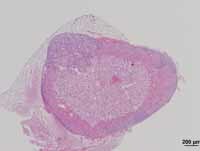 This is a 25x image, 25bx, that is a higher magnification of the upper-center area of the 10x image. 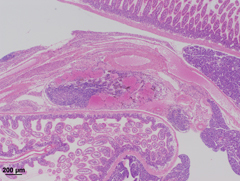 This is the small intestine from a 623 day old female SM/J mouse. 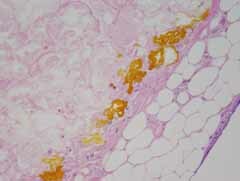 Note the accumulation of cells on the serosal surface and similar cells filling a lymphatic. 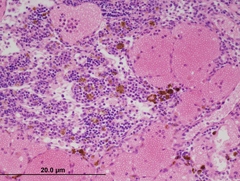 Similar cells are found proliferating in the red pulp of the spleen suggesting that this is an erythroid leukemia. 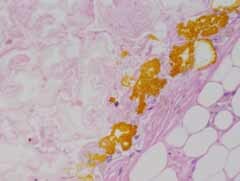 Additional marker studies are needed to verify the diagnosis. This is a 40x image. This is a 10x image that is a higher magnification of the lower-left center portion of the 4x image. 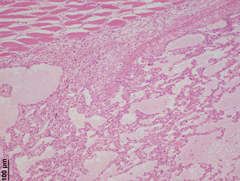 This is a 10x image that is a higher magnification of the right-center portion of the 4x image. 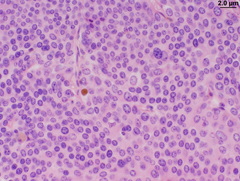 This is a 25x image that is a higher magnification of the left-center portion of the 10x image. 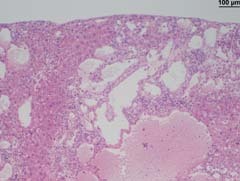 This is a 4x image that is a higher magnification of the lower-left portion of the 2.5x image. 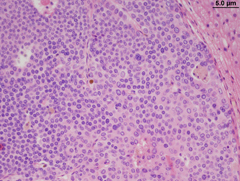 This is a 40x image that is a higher magnification of the top-center portion of the 10x image. 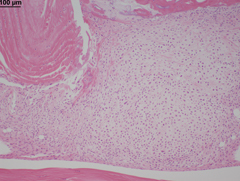 This is a 10x image that is a higher magnification of the upper-right portion of the 4x image. This is a 10x image that is a higher magnification of the top center region of the 2.5x image. This is a 4x image that is a higher magnification of the middle left region of image 2.5xa. This is a 2.5x image, 2.5xa. This is a 2.5x image, image 2.5xb. This is a 25x image that is a higher magnification of the top center region of the 10x image.